Native to the southeastern United States, muscadine grapes have been cultivated commercially in this part of the country since the middle of the 18th century. Early cultivars were simply selections from the wild, but current cultivars were all developed from breeding programs. The University of Georgia operates the country’s oldest and largest muscadine breeding program. The program, which began in 1909, has released more than 30 cultivars. UGA currently is actively developing new self-fertile cultivars with large berry size and high fruit quality to replace older female-flowered cultivars. 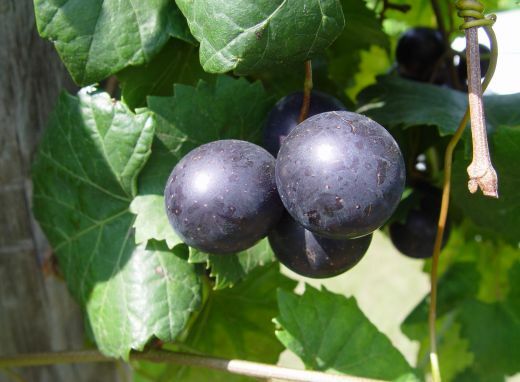 The muscadine grape differs from the common bunch grape (Vitis labrusca L., V. vinifera L., et. al.) by the presence of smaller clusters, unbranched tendrils, berries with thick skins and a unique fruity aroma. Muscadine grapes are an important fruit crop in the Southeast where Pierce’s disease (Xylella fastidiosa Wells et al.) and other diseases limit the production of most bunch grape cultivars.